Not everyone is clapping about California’s rather awkward step into legalized adult marijuana use. Sure, anyone over 21 can go get a joint now – provided you can find a dispensary, are willing to wait in line, have lots of money and aren’t particularly worried about quality. Those of us who’ve enjoyed the somewhat casual medical markets over the years are now screeching in horror at what’s happening to our beloved cannabis industry and favorite dispensaries. The horror. The HORROR. We’ll get over it, but meanwhile, here are our top 10 things to hate about recreational marijuana in California as well as how to beat them. Bah. Humbug. 10. Lines: Waiting five minutes to get in to a dispensary is fine. Waiting 45 minutes with a bunch of folks who are going to spend another half hour trying to decide which $10 preroll to buy? No flipping way. Beat it: Order online for pickup and laugh at the fools in line. 9. Amounts: One ounce per day or 100 mg limit on edibles? For medical patients, that’s laughable. Fortunately, a prior medical recommendation should get you the 8 ounce, over 100mg limit. If you’re adult use, you’ll likely have to make more visits — no more stocking up and pay, pay, pay. Beat it: Medical cards are your best bet. 8. Sight unseen and unsmelled products: That familiar skunky smell of dispensaries is history. No longer can budtenders open jars of bud for a whiff, or closer inspection. From flowers to expensive concentrates, everything is pre-packaged with child and tamper-proof lids, meaning no more visual inspections or sniffs of those lovely terpenes. Budtenders literally have to explain it to you: “It’s sort of like, well, like sort of smooth. And it smells like pine and it made me want to eat cinnamon toast.” Um. Thanks? Beat it: Find a great budtender? And write to your elected representatives. 7. There’s hardly anywhere to buy recreationally: There are three licensed recreational dispensaries in Sonoma County, and only about 400 in the state, mostly in Southern California. Santa Rosa currently has no adult use dispensaries. Oakland, Berkeley and Santa Cruz have a few, but San Francisco has none, so far. Beat it: Go medical. And write to your elected representatives. 6. State Issued Medical Marijuana Identification Cards: The only “medical” cannabis card that will afford you a tax break are state-issued and cost about $100 to acquire. New MMIC recommendations must come from a primary care doctor, then submitted and approved by the state health department. Though there are promises of protection, you’re telling the state of California you’re a user of a federally illegal drug. That list is like catnip to people who don’t want marijuana to be legal. You’re also going to be in real hot water if you have guns, since there’s a federal mandate against using drugs and operating or owning guns. Beat it: Don’t get a state MMIC. 5. No one really knows what’s going on: With so many grey areas, emergency changes, unclear documentation, unclear rules and eagerness to cash in on cannabis, it’s safe to say that pretty much no one in the business of cannabis really knows exactly what’s going on. Nor do regulators, lawmakers, attorneys, producers, dispensary owners or journalists. There’s no road map, and we’re all just bumbling along day by day. Beat it: Ask at least 5 people for answers to any question. Average out the answers and you may be close. But probably not. 4. Overly packaged packaging: It took me five minutes to figure out how to open the bag my weed came in today. It took my husband another ten, and then we looked at the diagram and still couldn’t figure it out. The amount of new packaging is staggering, with the need for disclaimers, safety warnings, tamper-proof and child-proof packaging and frankly, adult-proof packaging. We’re all for keeping pets and kids safe, but when it takes 20 minutes just to open a bag and another five to go through unnecessary layers of additional packaging, that just seems like overkill. Beat it: Reuse your exit bags (which will cost about $2) because you’ve already figured them out. Be sober when you try to open the package. Make sure you already have a safe spot for your stash, because you’ll want to throw all that other junk in the garbage once you’re home. 3. California is now a bigger fatter target for Washington: Coincidence that Atty. General Jeff Sessions killed the Cole Memo just four days after California went recreational? Hardly. Whether its saber rattling or a real attempt to prosecute in legalized states, the whole thing is a major buzzkill. Beat it: The best way to resist is to educate. Here’s what California Atty. General Xavier Becerra had to say to the haters: “In California, we decided it was best to regulate, not criminalize, cannabis. We intend to vigorously enforce our state’s laws and protect our state’s interests.” So there. 2. Taxes: We knew they were coming, but a 25 percent tax on cannabis is can hit you like a sucker punch in the gut. There’s the 15 percent state excise tax in addition to county and city taxes ranging from 8 to 10 percent. 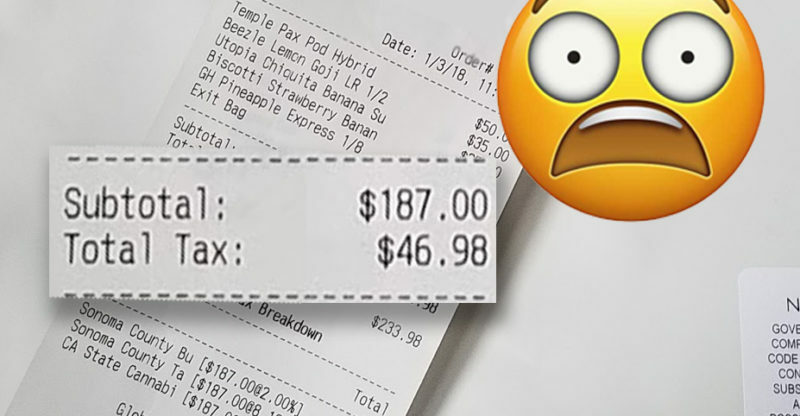 Some dispensaries build in the cost to the product, others show you the terrifying number — like $46.98 on a $187 purchase. Expect that more folks will want a piece of the pie moving forward. We’ll have more coverage of this ongoing issue next week. Beat it: Just close your eyes and think of England. And write to your elected representatives. 1. Weed just got more expensive than gold: Gone are the days of great, artisanal, cheap Northern California weed. Because unless you’re willing to buy a pre-roll, you’re going to pay dearly for that 1/8th. We saw our favorite vape concentrate go up in price almost $20 since Jan. 1 (before tax). A $60 eighth was once rare, and is now pretty much the norm, with $70 and $80 eighths common. Prerolls are $10 to $20 for a single joint, and concentrates are almost prohibitively expensive, running at $55 per eighth up to $225 or more, and the once-cheap vape cartridges ($30) are now $50 to $85. Gold, by comparison, is about $41 per gram. So do the math. Beat it: Grow your own. I’ll Take The Side Salad: Is Raw Weed The New Superfood?